My husband and I have been together for over 30 years. This June we will celebrate 10 years of marriage. We are now legally married in all 50 states and some countries. It has been a long road. Somewhere around year two, we think, we bought Claddagh Rings for each other. On our tenth year together we bought a thin gold band to wear alongside the claddagh. We had a huge party with friends and family around year five and that was always thought of as our defacto wedding, no commitment ceremony just a huge celebration with those we loved. Now in all those years we attended many “traditional” weddings. It became our tradition that while the couple was saying their vows we would press our rings together, kinda like the Wonder Twins, and when they were pronounced husband and wife we would release our rings. Sort os a prolonged fist bump if you will. No one ever questioned us so what the heck we kept doing it. So we figured that there was a lot of Marriage mojo or juju or luck or positive energy in those rings right? When we decided to get married in 2007 we did not want to wear the claddagh and band on the right hand. We thought of framing them but then we decided why not melt them down and make new wedding bands out of them! When we asked one jeweler to do this she refused or strongly suggested against melting down perfectly good claddagh rings and the bands. She thought the idea of a metal retaining the positive energy of 25 or so wedding ceremonies was ridiculous. So no job for her. Finally we met a jeweler through a friend that thought the story was nice and better yet since the rings we picked would have to be cast anyway, the gold from four rings would save us some money. No comment on the reality of magically captured wedding energy, which I thought was classy of her really. Jumping forward, I recently had a part in the play and I was asked if I minded not wearing my wedding ring. Oddly enough this was the first time in decades I was asked this as most of the characters I played either were or could be married or it just didn’t matter. I removed the ring and tucked it safely in a my bedside table. I can not tell you how many times in the weeks that followed I felt an ice cold panic as I realized the ring was gone and began to retrace my steps before I remembered were it was. Although I do sometimes miss the other rings I do love that we are in essence still wearing them. We could have easily worn these rings as our actual wedding we wanted to transform them as our relationship was being transformed. Having never thought this would actually be an option for us we did not take marriage lightly. It meant something very profound and special. It came with a weight and responsibility. Sure you could argue that all those things were already there, but it felt as if all that energy we put ito our relationship was indeed being transformed into something else just like those rings were. So since I was ringless for a couple of weeks the rings now need a proper recharging. We are headed to Alberta Canada to witness the wedding of my cousin’s daughter. 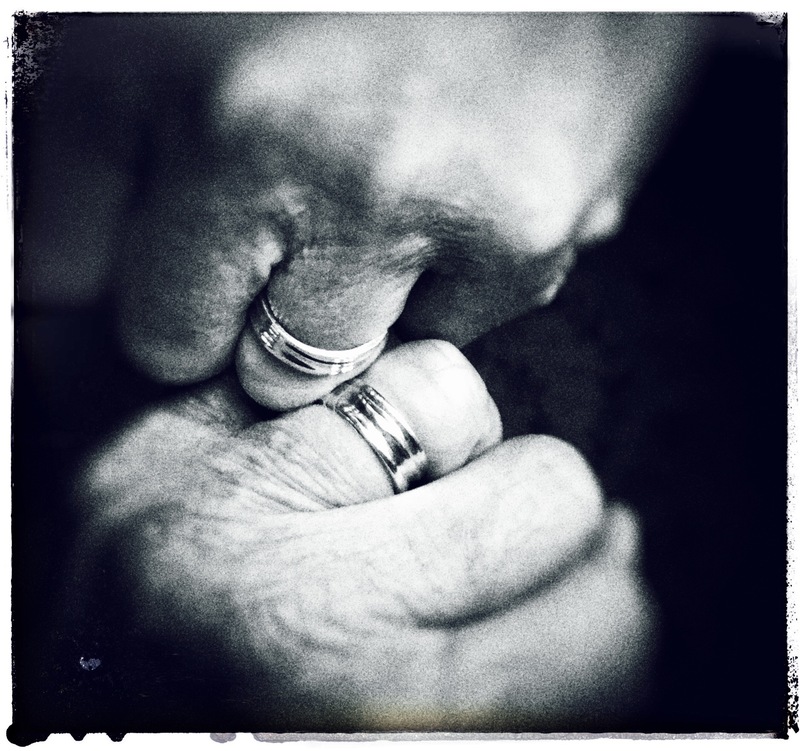 We will as always press our rings together Wonder Twins like and capture a bit of the positive energy of that ceremony to get us through the years ahead. Can a hunk of precious metal capture positive energy? It is just a tangible symbol of an ancient ceremony between two people or a magical talisman. Do I believe our rings are a tad bit magical? Does it really even matter all said and done? Does it really matter what I think? Well if you made it to the end of this blog you must already know the answer to that is Yes, Yes I DO.